Meet Sarina, the creative talent behind the cycle clothing brand with a difference, Cycology. 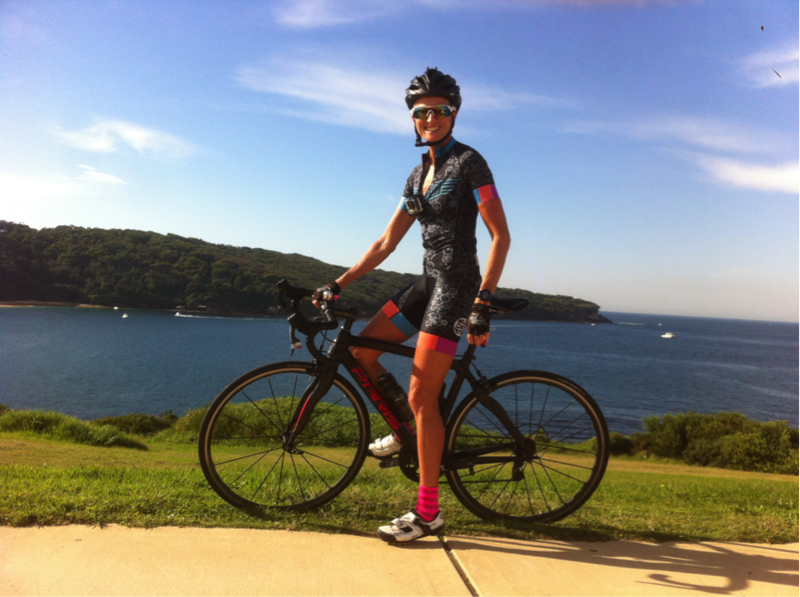 Sydney-based cyclist Sarina Tomchin has found a unique way to share her obsession for cycling, which she says is the ‘salve for her soul’. Sarina Rocking Lucky Chain Ring Kit @ La Perouse, Botany Bay, Sydney. A successful commercial artist, nothing inspires Sarina more than riding her bike. Her shelves at home brim with filled sketchbooks inspired by her rides. When people started asking Sarina to put her art to fabric, the idea for Cycology cycle clothing was born. ‘At Cycology, we say ‘live to ride, ride to live’, Sarina says. ‘Cycling has been the salve for my soul. When anything is off-kilter in my life, heading to the hills on my bike has always saved me, it cures almost everything. My mission is simply to share that joy, because nothing can bring you happiness like a bike ride does. ‘I was already a successful commercial artist. And in every spare minute I had, I was cycling, ultra trail running, adventure racing, and mountain biking. I’d come back from rides and start drawing everything I’d been inspired by. In 2011 the brand Cycology was born as a t-shirt company featuring Sarina’s cycling graphics. ‘People started asking me for cycling kit with Cycology illustrations, but I wasn’t sure that anyone would want to wear it – you don’t see hand drawn kit. We started by designing a single jersey, which was a huge success. So, we started making more,’ Sarina says. ‘I just love wearing these kits. They just wouldn’t get made if I didn’t, it’s as simple as that. I hate those club jerseys in offensive colours with logos stuck all over them! I create fashion-oriented designs that you can feel proud to be seen in. It’s not often that you find motivation under your gusset, but Sarina has a sense of humour. On a Cycology chamois you’ll find a beautifully drawn collection of motivational quotes: ‘find the one you love and stick with it.’ ‘It doesn’t get easier, you just get faster’, and brilliantly, ‘The agony & the Xstasy’, where X marks the spot. Sarina’s skulls and cogs adorn the kits with the most beautifully intricate level of detail. ‘I have many, many cogs, and I love clusters and chains; I keep all my old ones,’ she says. ‘I aim to communicate my love of cycling through my artwork. Because to conquer mountains, ride through the night, see the sunrise, share the honour and achievements with training buddies – it’s what we do as cyclists, no matter how fast or slow we are. 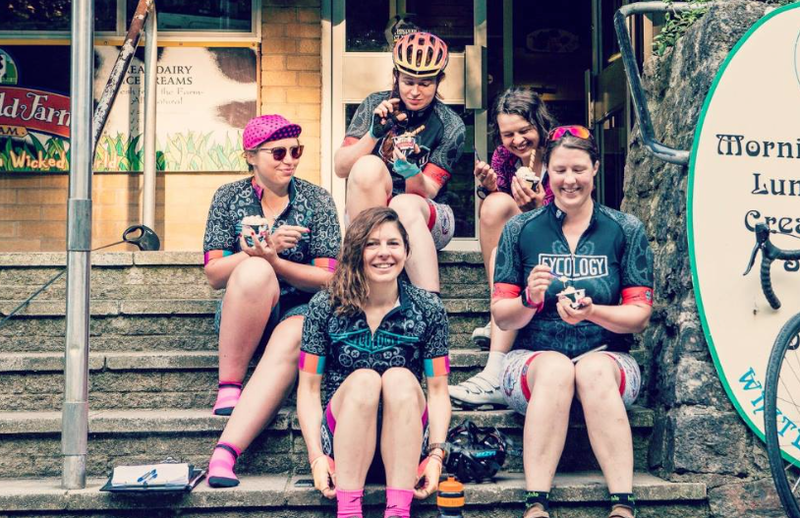 We are all one big community of people passionate about the philosophies around cycling. Every ride becomes another great adventure, every person I meet on a bike becomes a new friend, every new route teaches me something new. I come home exhausted, sweaty, dirty, sometimes soaked to the skin, but always with a big smile on my face and a gleam in my eye. I don’t know about you – but I get on that bike, and I smile. The First Double Brutal Woman.